Home→Upcoming Books→So Much Buzz for STILL NIGHT IN L.A.! ← Enter to Win a SIGNED Weird Girl & What’s His Name ARC! People are raving about Aram Saroyan’s Still Night in L.A., the new detective novel releasing this fall on 3RP, and we couldn’t be more thrilled! 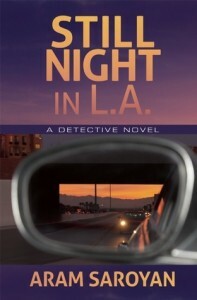 Still Night in L.A. begins when Michael Shepard, a detective with his own set of problems, is hired one morning by a fashionable young woman at her Hollywood apartment. Soon he’s embroiled in a murder investigation that may shed light on a nearly forgotten tragedy. A divorced father wondering how to set his son on a better course in life, the detective gets into deepening trouble as he negotiates a vivid panorama of the town’s modern-day beautiful and damned. Author Aram Saroyan harnesses the hardboiled styles of Chandler, Hammett, and Ross MacDonald into a contemporary tale of information age intrigue. The text is supplemented with cell phone photos taken by Saroyan in the same environs in which the story unfolds.